Astronomers have found the faintest object ever observed from the NASA's Hubble and Spitzer space telescopes. This object existed about 400 million years after the Big Bang, which is about 13.8 billion years ago. The team that discovered it has given it the name “Tayna” which is a word of Aymara, a language that is spoken in the Andes and some regions of South America. All though Hubble and Spitzer have discovered other galaxies that have much greater distance. 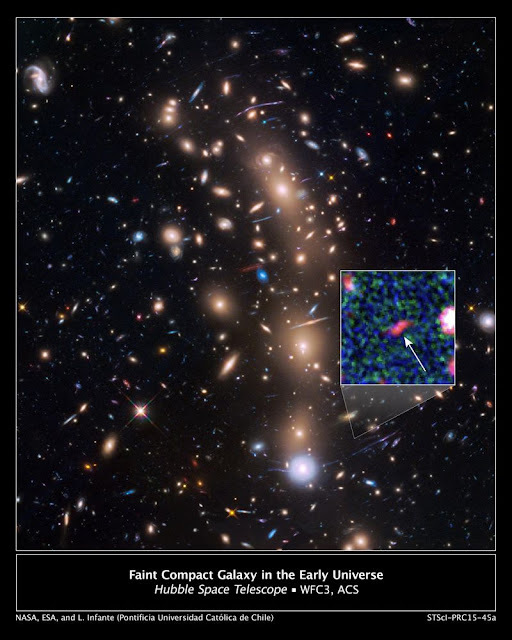 This object shows a smaller and fainter category of newly forming galaxies. These dim objects may describe more about the early universe and put forward the new perception about the formation and evolution about the early galaxies. Lead Author Leopoldo Infante, an astronomer at the Pontifical Catholic University of Chile said "Thanks to this detection, the team has been able to study for the first time the properties of extremely faint objects formed not long after the big bang”. This distant object is part of a discovery of 22 young galaxies at ancient times located nearly at the observable horizon of the universe. This research is a significant addition in the number of known remote galaxies. The image below is a Hubble Space Telescope view of a very massive cluster of galaxies, MACS J0416.1-2403 that is located nearly 4 billion light-years away and weighs about million billions of Suns. Its distance was evaluated from the Hubble and Spitzer’s observations. The light from the remote galaxies seems reddened due to the enlargement of Universe. Although many stars of galaxies are blue-white, their light has been changed into infrared wavelengths which are measured by Hubble and Spitzer. The absorption of cool intergalactic hydrogen also causes the galaxies to look red. Further information about that object will be exposed by James Webb Space Telescope. Astronomers expect that Webb will help us to visualize the fetal phase of galaxy’s nativity after the Big Bang.